The 2015 Honda Odyssey in Dayton, OH is a best-selling minivan that can fit up to eight passengers and keep them safe with its excellent safety offerings. After its recent makeover, the 2015 Odyssey interior cabin is loaded with innovative features to keep passengers entertained and comfortable. The 2015 Honda Odyssey is available in many different trim levels so you will be able to get all the features and options you want without having to pay for the ones you don’t. The Honda Odyssey’s best attributes are its overall driving experience, comfort and safety features. 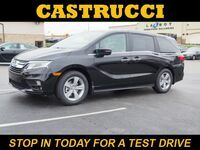 This Honda minivan has been giving families the best choice for a new family vehicle for years and continues to do so in the 2015 Honda Odyssey at Matt Castrucci Honda. Now that we have it in stock, it's your turn to try out the 2015 Honda Odyssey in Dayton, OH in person. Schedule a test drive today and experience the difference. 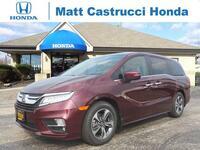 Interested in a 2015 Honda Odyssey? The 2015 Honda Odyssey in Dayton, OH offers some of the latest technology features to help it stay ahead of its competition even further. Choose from items like an 8-inch color touchscreen audio interface, a standard rearview camera, smartphone app integration, built-in Honda Vac system and active noise cancellation. These features are just the tip of the iceberg, there are many more impressive features that you will love to have in your new 2015 Honda Odyssey. The safety features offered in the new Honda Odyssey is where you will really see the incredible value of this impressive minivan. Choose from advanced safety features like lane-departure warning, forward collision alert, blind-spot monitoring system and many others that will help protect you and your passengers. When you start looking for a new vehicle that offers versatility, there are not many that can deliver it like the new 2015 Honda Odyssey in Dayton, OH. This versatile minivan gives you a second-row seating system that can be adjusted to create a middle aisle or side aisle to make it easier to to access the third-row seats. The handy third-row seat offers a 60/40 split and is easy to fold up and down. The 2015 Honda Odyssey’s doesn’t just give you versatility on the inside, it also delivers it on the outside and under the hood. With its 3.5-liter V-6 engine that puts out 248 horsepower, you will be able to tow up to 3,500 lbs.